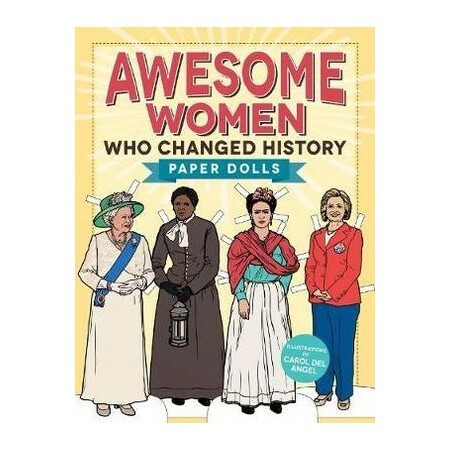 A collection of paper dolls featuring adventurous, daring and trailblazing women from history. Forget the runway. These 'Awesome Women Who Changed History' are dressed for the battlefields, the picket lines--and the top roles! These 21 realistic paper dolls have everything they need to shatter the glass ceiling. Prepare Sally Ride for liftoff with her spacesuit and helmet. Get Annie's gun (and her hat and dress) before she heads into a sharpshooting competition. And please rise for the honorable Ruth Bader Ginsburg, whose robes and gavel will have her ready to preside over the United States Supreme Court. Whether conducting research while living with the gorillas in the mist, mastering the art of French cooking, or leading travelers on the Underground Railroad, the paper doll likenesses of these groundbreaking women are sure to inspire awesome women of any age. AUTHOR: Carol Del Angel has worked as an illustrator since 2004. Eclectic but well considered, her work is built on an interest in people, nature, typography, architecture, and pattern. She has has exhibited at Exposicion Publicidad in Mexico and was included in the Vox Pop exhibition at the Coningsby Gallery in London. Her website is www.caroldelangel.com. SELLING POINTS: For girls and women of all ages! A twist on the traditional paper dolls, focusing on women's roles and contributions with accessories like gavels and flight suits. Paper dolls are popular with celebs like Lourde and Taylor Swift (Bustle). Vulture puts out a new collection of paper dolls, based on pop culture, about once a month (Downton Abbey, 63.6K+ shares).